Along the Great Ocean Road, whales are very often sighted. Winter is the best time to see these magnificent creatures of the deep blue sea. The most common times to see whales migrating from Antarctica is during June, July and August. Usually Humpback Whales are en route to Queensland, and the Southern Right Whales spend time on the sheltered Victorian coast. They use the coast to breed and raise their calves. Recently, in 2011, the sightings of whales began as early as March. 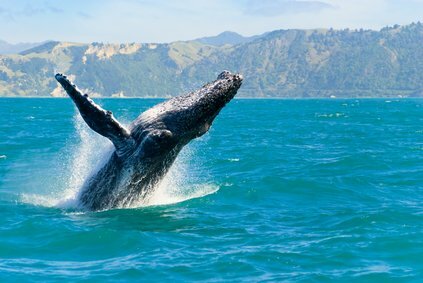 When one or more of the massive creatures are sighted, whale-sighting flags will be hoisted at Wye River, Lorne, Onion Bay and Apollo Bay . The purpose is to alert people to cast their eyes out to sea for a chance to catch a glimpse of them. 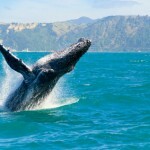 To get the most out of this special time, there a number of Whale Watch initiatives in place. This lets visitors know when whales have been spotted off the coast. A diary is kept of confirmed sightings which records times and locations. This diary is located on the regional visitor site www.visitgreatoceanroad.org.au. Where possible, the breed of whale is also recorded. Any visitors to the area are encouraged to record any sightings in the blog. If you ever get a chance to view whales from the Great Ocean Road, you too will agree it is spectacular. However, use common sense and please exercise caution when driving and please obey road rules by not stopping or starting suddenly, parking off the road and obviously not doing any illegal U turns especially near on coming traffic. Take care when enjoying the magnificent whales. This entry was posted in The Great Ocean Road Information and tagged apollo bay, great ocean road, whale watching by Holiday Great Ocean Road. Bookmark the permalink.